EvernoteYou don’t see many of these in engineering. Although sexism in the workplace is illegal and has been for a long time, certain industries still seem to be overtly dominated by men, especially the computer engineering field. Pitch Interactive’s Ri Liu and Pinterest engineer Tracy Chou have compiled data that shows just how large the gender gap is at some of today’s biggest tech companies. A few tech companies even have nearly 100 male engineers on their team while the number of female engineers sits in the single digits. 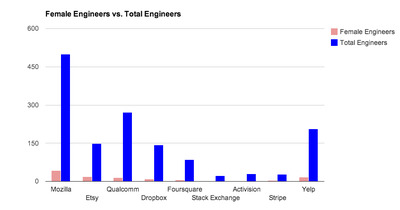 Dropbox, for example, has 134 men on its engineer team and only nine women. Mozilla is another extreme scenario, as Chou’s data shows that there are 457 male engineers and only 43 female engineers. Mozilla has the largest number of female engineers of all the companies on Liu and Chou’s list, but it also has the biggest engineering team in general. 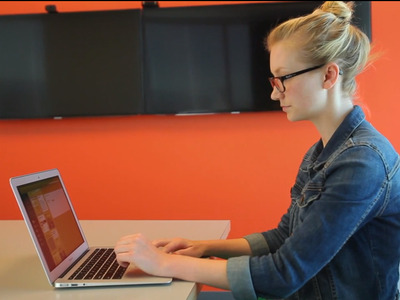 Companies with smaller teams only had one female engineer on their staff, such as Activision, Learnist and Bitly. Liu and Chou compiled a spreadsheet of the data and converted it into an infographic titled “We Can Do Better.” The infographic visually represents the dramatic difference between the number of male and female engineers working in tech. We took some of the numbers from Liu and Chou’s spreadsheet and made a chart to illustrate the discrepancy between male and female engineers. The pink represents the number of female engineers while the blue symbolizes the total number of engineers at each company based on Liu and Chou’s findings. The issue of sexism in the tech industry, unfortunately, sometimes manifests itself in more than just sheer numbers. Last month former GitHub engineer Julie Ann Horvath left the company after claiming that she had been bullied and felt threatened. Horvath told TechCrunch that a male engineer had even begun to rip her code out of projects after he had awkwardly tried to date her and had been shot down. Chou and Li’s data follows another recent report from HRAdvisors that showed there is a difference of between 20 and 50 per cent in the number of male to female workers at tech companies in New York City.